Equivalence - The Ecological Footprint of Fish. Chow and Lin. 2017. We examined the impact of farm fishing through the large yellow croaker (大黄鱼) which is China's most popular fish. 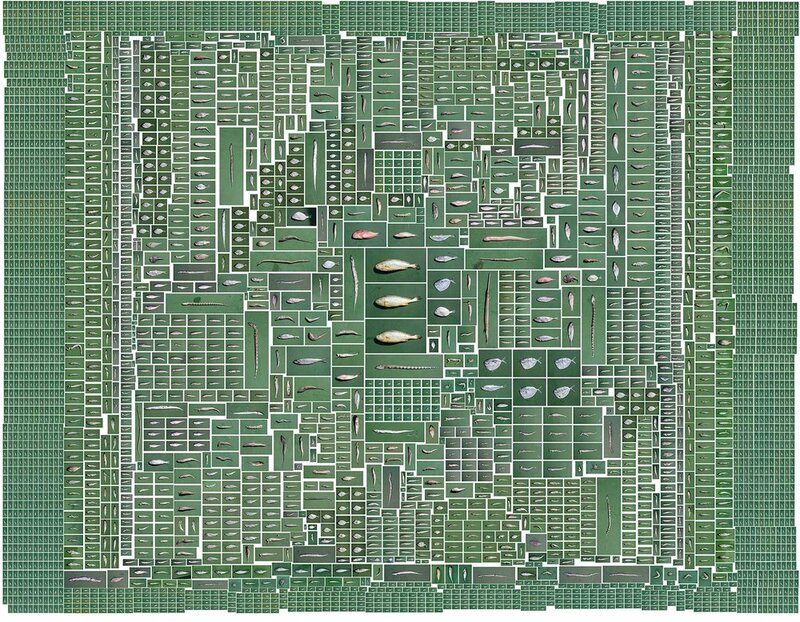 Working with scientists, fish experts and local government officials, we traversed 4 towns in Fujian China to build a tessellated mosaic of fish portraits to see how much wild small fish is needed to sustain fish farming. The answer is 7.15kg, 39 species, more than 4000 wild small fish to raise a single kilogram of large yellow croaker. They are the 3 singular fish at the centre of the picture. The large yellow croaker is China’s most popular fish, and they used to be caught in the wild for generations. Overfishing coupled with a sharp rise in consumption in China has led to a near extinction of the large yellow croaker species in the wild. Today, virtually every large yellow croaker is farmed, and they are fed with wild small fish caught in the nearby China seas. Many of these fish are caught premature, and these species are threatened due to overfishing and lack of regulation. Each year, 400,000 tonnes of wild small fish are caught and ground into large yellow croaker feed, and 7.17 million tonnes of wild small fish are caught in total. China accounts for more than 60% of the world’s aquaculture output.